Handle bar, one in the front, one in the back to push, pull and steer the SkyCart. Heavy duty lock plate with latching mechanism. Can be secured with small padlock. Brake pedals. Red to set all four brakes, green for brake release. Four 360 degrees castor double wheels for hard floor AND carpet. All four have brakes. Door opens all around (270 degrees) and is held in place there by a magnet. 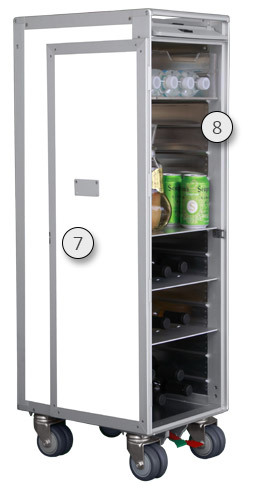 13 runners inside allow for 13 shelves or 7 drawers or any combination. Weight: 29.5 lbs empty, inserts/accessories add between 1 1/2 lbs each. Sturdy aluminum frame attached to strong aluminum bottom plate. Four high quality wheels with roller bearings ensure durability. All four wheels have brakes. Red pedal sets the brake, green pedal releases the brakes.